“Keep the fire going,” was Christopher’s parting advice today as left for a day in town running errands. He needn’t have told me. My day consisted of researching health insurance options online and making phone calls to health insurance brokers in search of a reasonable alternative to our current individual policies. It’s not easy. Some online sources requested only a phone number, zip code, and number of employees. One broker actually took information over the phone. Others didn’t return my messages. Back in a former life I did this sort of thing annually for a mid-sized firm of 20-40 employees. I have a feeling it was easier than trying to locate a health insurance company that might be willing to cover two people who have a small farm business will be. After deciding the day was shot and no one else was likely to return my calls, I knit two rows on my llama shawl. While the pattern is lacey it will be a warm shawl, not a showy fancy delicate shawl. 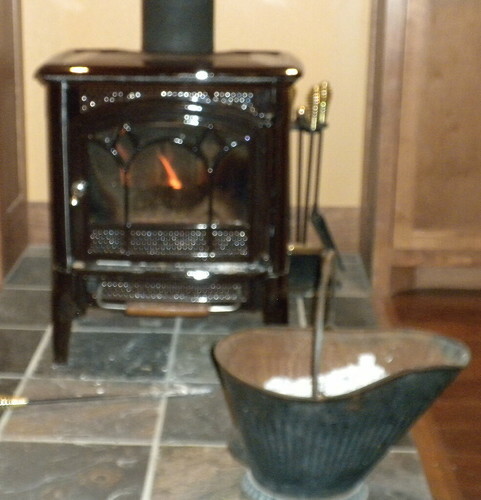 Throughout the day, I added a log now and then to the wood stove. Admittedly we have other sources of heat in our house but the wood stove allows us to keep the temp set low and use natural resources. During the days that our house was being built Chris cut and I stacked wood when other chores were light, especially last winter. Earlier this fall a big sycamore fell beside the house. Chris sectioned it up and made quick work of adding it to our woodpile and the woodpile at his father’s farmhouse across the barnyard from us. As I write the temp is forty degrees F. When the sun sets the temps will dip lower, possibly to freezing. Snow is expected in parts of our state. While forty degrees isn’t terribly cold, I have taken my role as Keeper of the Flame serious. 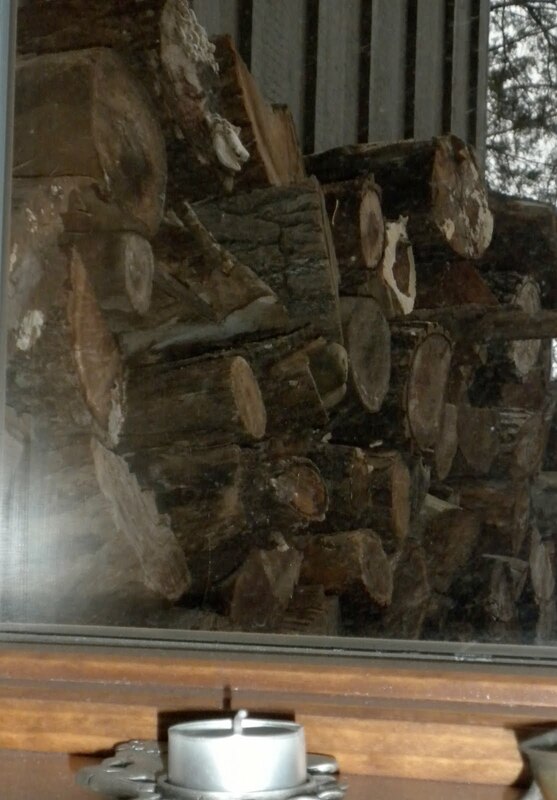 By five pm I’d restocked the wood on the porch that will feed the fire through the evening and into the next few days. The woodpile is covered by tarps to keep the wood dry while the trees are bare of leaves. This weekend several inches of rain had fallen and large pools of water had settled into the low spots of the tarps. After I was happy with the wood on the porch, I released the bungee cords that held the tarps and made spouts to allow the rainwater to escape, then readjusted where I’d taken off logs to try and create natural spouts so the next rain wouldn’t pool so much. I swept off batches of wet soggy leaves from the tarps that were level with my head by climbing on the lowest timbers. My leather gloves were wet and dirty, as was my barn coat by the time I’d finished. But I felt satisfied with my task. All the while I worked I thought about the myth of Vesta, Keeper of the Flame. Vesta was the virgin goddess of home and hearth in Roman mythology. Throughout history women have been given this task – keeping the fire. It reaches much further than my keeping the wood stove fired up, it is about keeping the family fed, the family warm, the family healthy, the family safe. Historically, without fire how could any of those be accomplished? I honor Vesta Keeper of the Flame.